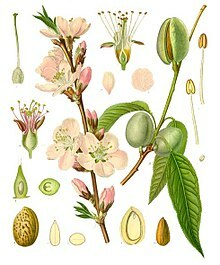 The almond (Prunus dulcis, syn. Prunus amygdalus) is a species of tree native to the Middle East, the Indian Subcontinent and North Africa. "Almond" is also the name of the edible and widely cultivated seed of this tree. 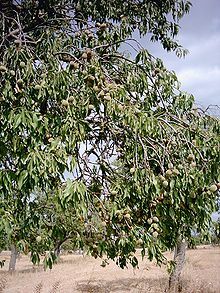 Within the genus Prunus, it is classified with the peach in the subgenus Amygdalus, distinguished from the other subgenera by corrugations on the shell (endocarp) surrounding the seed. The almond is a deciduous tree, growing 4–10 m (13–33 ft) in height, with a trunk of up to 30 cm (12 in) in diameter. The young twigs are green at first, becoming purplish where exposed to sunlight, then grey in their second year. The leaves are 3–5 inches long, with a serrated margin and a 2.5 cm (1 in) petiole. The flowers are white to pale pink, 3–5 cm (1–2 in) diameter with five petals, produced singly or in pairs and appearing before the leaves in early spring. Almond grows best in Mediterranean climates with warm, dry summers and mild, wet winters. The optimal temperature for their growth is between 15 and 30 °C (59 and 86 °F) and the tree buds have a chilling requirement of 300 to 600 hours below 7.2 °C (45.0 °F) to break dormancy.